No less than 80 days have passed since we decided to get into Greenlight. It’s been (it’s still being) quite a ride. Three years after Peter and Ollie outlined for the very first time the core for the game, what Verne wrote seems to be true: eighty days are more than enough to travel around the world, even if (as far as I know) we haven’t used any new railway in India. As for Indies… well, maybe! We have been featured in more than 300 podcast, international videogame sites, youtube great channels, tiny personal blogs, or even local media. WOW. Every ambitious project as its milestones, and the long path along which we are creating Teslagrad—and, at the same time, being accompanied by the aforesaid— is about to meet a new goal. But let me explain, no rushes. As you already know, Valve’s valve opens from time to time, and recently a new batch of games have been approved, taking positions on the frontline that heads to Steam. Yes, the distributor, store and sanctuary of the Introduce-Word-Here Sales jeopardizing our wallets. We’d like to take the occasion to congratulate our friends on Krillbite Studio, which are part of the new batch of greenlit games thanks to Among The Sleep, an outstanding first person horror adventure which will turn all of us into crybabies again (literally). That’s a great news itself! But the Teslagrad Makers Traveling Circus has something to celebrate too: we are now on top #12 (and climbing), which means that we could be following them pretty soon. BRAVO! A lot of good news, as all of you, our dear Teslamancers to be, are able to see. In point of fact, the whole Rain Games team wants you to be closer than ever. You, who have celebrated with us each one of our successes. You who gave us your unvaluable feedback, who joke with us on twitter. 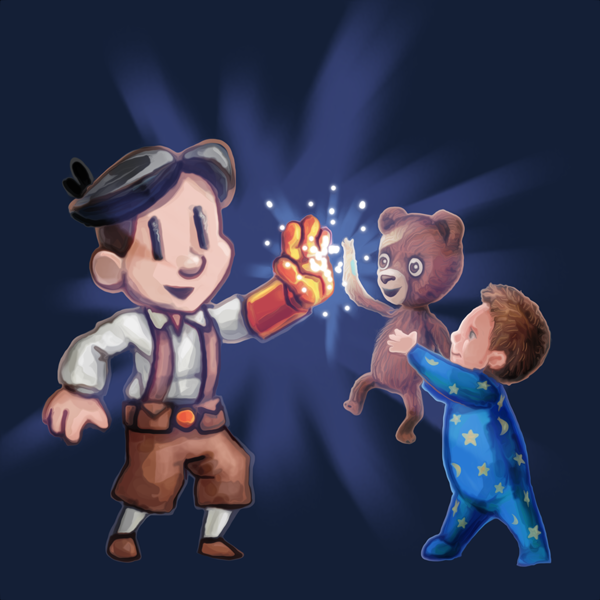 You who are testing the Teslagrad alpha side by side with us (again THANKS, you’re awesome). Its one final push to have the door to Steam opened, and we don’t want you to miss it. So a really good way to do your bit is to upvote and share our Greenlight project (fortunately we won’t be saying this again soon, lol!) and, above all, stay tuned. The next months will be incredibly exciting for the Rain Games crew. Hope it is for all of you too :D.
This entry was posted in The Blog and tagged Among The Sleep, Greenlight, Teslagrad by Eduardo. Bookmark the permalink.